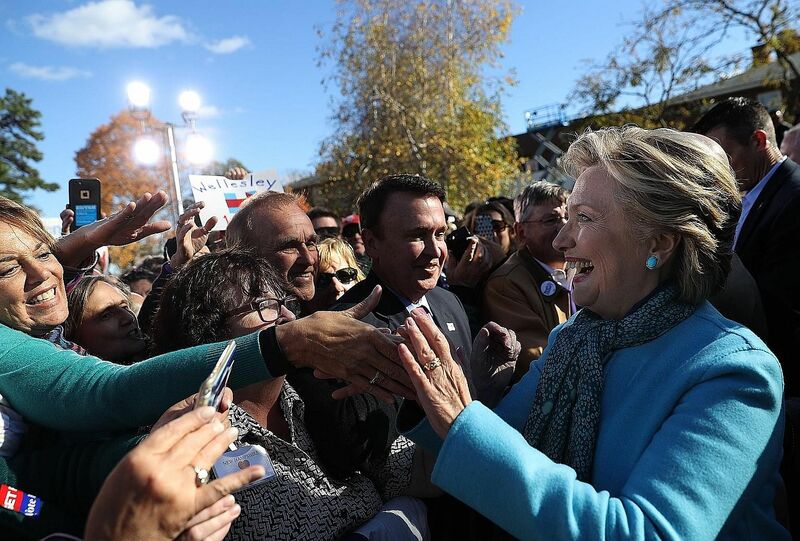 Although this year's presidential race has not been a season of gentle ironies, there's one to be found in the revelation of what are alleged to be Democratic candidate Hillary Clinton's closed-door speeches. After all the fuss about the bombshells they might contain, they show a warmer and more relaxed figure than the guarded, elusive and sometimes evasive persona she presents to the public. Just as refreshing, they show a disarming candour - including candour about lack of candour. Politicians need to be two-faced, Mrs Clinton supposedly said (the campaign has not confirmed the leaked documents' authenticity). If her frank critique of frankness proves to be more of a political non-event than a bombshell, as has been the case to date, that will be for a good reason: Most of us know she is right, even if we don't admit it. When charged by Stephen Douglas with being two-faced, Abraham Lincoln replied not with a denial but with a quip ("If I had another face, do you think I would wear this one?"). Citing his example, Mrs Clinton is reported to have said this in a 2013 speech to the National Multifamily Housing Council: "You just have to sort of figure out how to - getting back to that word, 'balance' - how to balance the public and the private efforts that are necessary to be successful, politically, and that's not just a comment about today." She added: "Politics is like sausage being made. It is unsavoury, and it always has been that way, but we usually end up where we need to be. But if everybody's watching all of the backroom discussions and the deals, then people get a little nervous, to say the least. So you need both a public and a private position." Right. In politics, hypocrisy and doublespeak are tools. They can be used nefariously, illegally or for personal gain, as when President Richard Nixon denied complicity in the Watergate scandal, but they can also be used for legitimate public purposes, such as trying to prevent a civil war, as in Lincoln's case, or trying to protect US prestige and security, as when President Dwight Eisenhower denied that the Soviet Union had shot down a US spy plane. During his 2008 presidential campaign, Mr Barack Obama promised to televise negotiations over healthcare reform, but when the real work had to be done, the negotiators shut the doors. In a study of defence Bills in Congress, the political scientist Colleen Shogan quotes a former Senate Armed Services Committee staff director as saying: "Why should we do it in the open? It would wreck the seriousness of the purpose. Staff need to give candid views to senators, and you can't do that in open session. Governing in the sunshine shouldn't be applied to everything." Is it hypocritical to take one line in private, then adjust or deny it in public? Of course. But maintaining separate public and private faces is something we all do every day. We tell annoying relatives we enjoyed their visits, thank inept waiters for rotten service and agree with bosses who we know are wrong. The Japanese, whose political culture is less idealistic than that of the US, have a vocabulary for socially constructive lying. "Honne" (from "true sound") is what we really believe. "Tatemae" (from "facade") is what we aver in public. Using honne when tatemae is called for is considered not bravely honest but rude and anti-social, and rightly so. Unnecessary and excessive directness hurts feelings, foments conflict and complicates co-existence. Modern social science makes a related distinction between shared knowledge and public knowledge. Public knowledge is information that is out there in plain and undeniable view, stuff like stock prices, weather bulletins and campaign promises. If knowledge is public, you and I both know it, and you know that I know it, and I know that you know it, and you know that I know that you know it, ad infinitum. If knowledge is merely shared knowledge, by contrast, you and I both know it, but I'm not sure if you know and you're not sure if I know. Shared knowledge has a very handy, if somewhat peculiar, trait: Even if we both know it, we can plausibly deny knowing it. Maybe you and I both know we dated the same person at the same time - but if neither of us is sure the other knows, we can both pretend not to know, thereby staying friends. Keeping knowledge out of the public domain can finesse all kinds of social conflicts and embarrassments. In-laws can pretend not to despise one another. Everyday life would be intolerable without public denials and mutual winks. They are equally important in politics. Behind closed doors, negotiators can float trial balloons and make tacit offers - deniably. They can say things like: "This isn't an offer, mind you, but just hypothetically, what if I were to suggest we could accept a Medicare cut if you could accept a capital-gains tax increase?" If you show hypothetical interest in my hypothetical offer, I can go and try it out on my caucus and constituents. If you wave me off - well, no offer was ever made, so I'm not embarrassed. Often, the only way to get something done is to have separate private and public truths. Behind closed doors, nothing is settled until everything is settled. Until the deal is done, everyone can pretend not to have decided anything. But the moment the conversation becomes public, plausible deniability ceases. Everyone knows I've made an offer. Angry interest groups, adversaries in the other party and even purists in my own party start cutting attack ads and lining up challengers to prevent a deal and defeat me. In diplomacy, having two faces is similarly indispensable. Until recently, the existence of the United States' use of drones for targeted killing was classified - not because it was a secret (everyone knew about it, especially the targets) but because public acknowledgment would embarrass key allies. As long as we pretended not to tell, they pretended not to know. Mrs Clinton's instinct is to overprotect her privacy and over-manage her image. This makes her less relatable as a candidate, breeds suspicion and caused her a world of grief over her e-mail. Fair enough to criticise her on those counts. Of course, she can't say so. At least not in public. In our hearts, we know she's right. But shush. It's a secret. • Jonathan Rauch, a senior fellow at the Brookings Institution, is the author of Political Realism: How Hacks, Machines, Big Money, And Back-Room Deals Can Strengthen American Democracy.